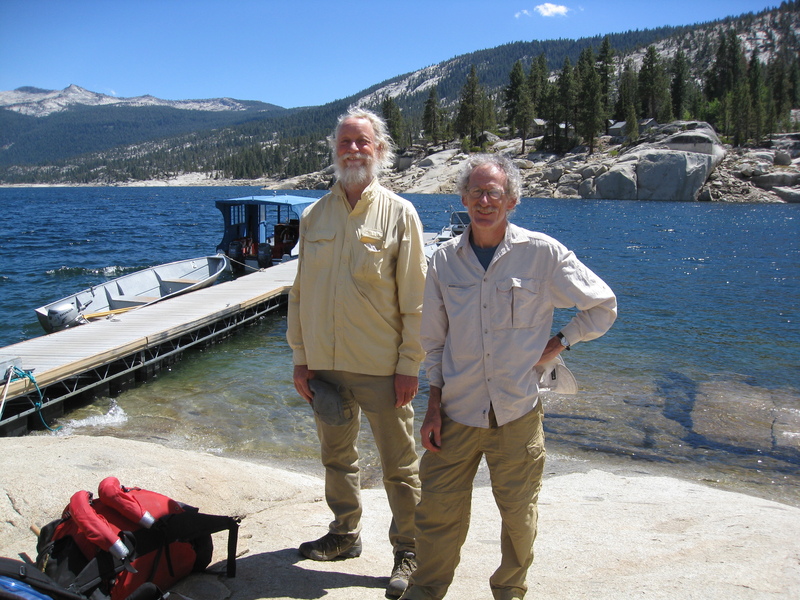 My two buddies and I left Santa Cruz in the morning, picked up our Permit in Prather, and arrived at Florence lake at about 2:00pm. Two of us took the ferry across but our other companion wanted to hike around. He got lost finding the boat dock, and so we ended up waiting for him for an hour. At a little after four we finally headed off to stop at Blayney Hot Springs for the first night, arriving there a little after 6pm. While the campground was fairly crowded, we found a somewhat secluded good sized site up on the left (upstream side). 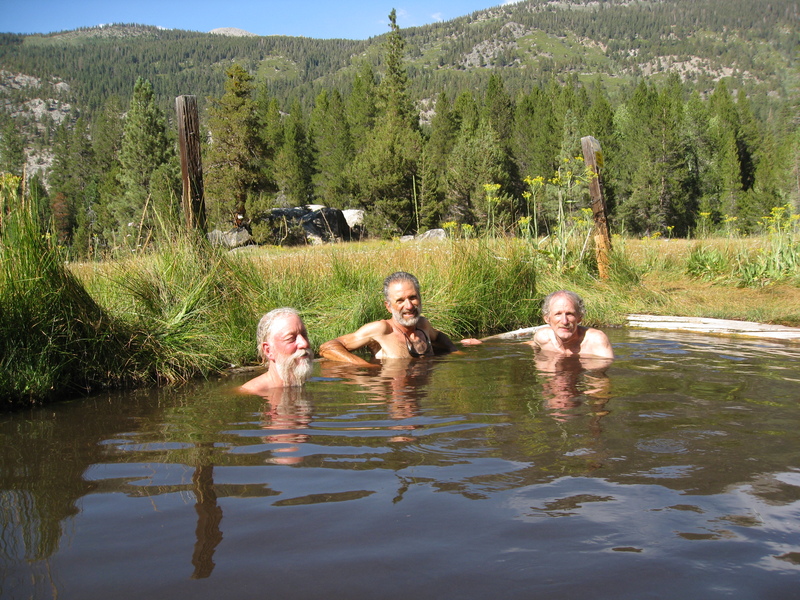 After setting up camp, we headed across the river for a soak in the springs and a dip in the relatively warm pond behind. Given the dry year, the river was easier crossing than it had been in the past, though it is wide and fast with a rocky bottom. I also discovered that my MSR stove was not working properly and I did not have tools to fix it. It must have been somewhat clogged as it gave out only a meager flame that took quite a while to heat water. We took another soak and swim in the morning. We broke camp and headed out at about 9:00. 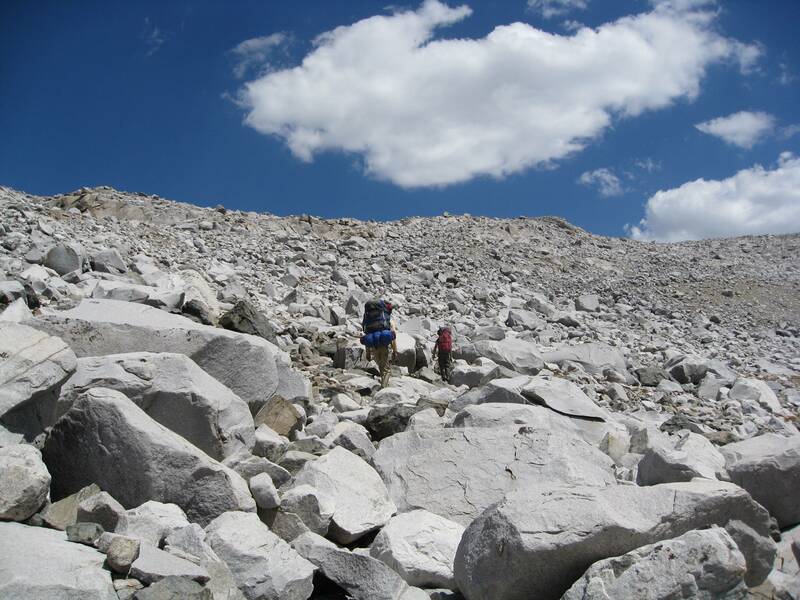 We reached the Piute junction at about 10:30 for a snack, where quite a large group was also resting. At about 1:00 we stopped for lunch just past the junction where the paths to Goddard and Evolution diverged and had a swim in a nice pool in the river. 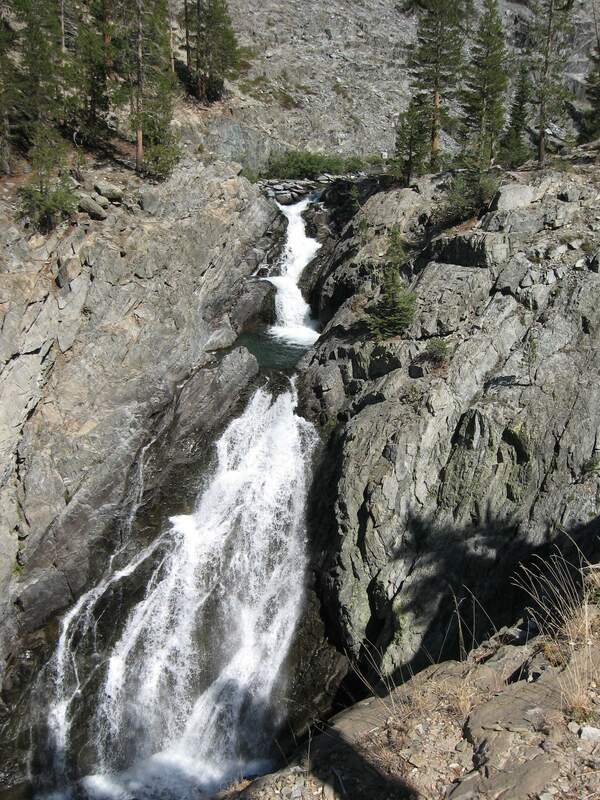 For much of the hike we were away from the river, but once we got back to it there were a number of impressive falls. Just past the Hell-for-Sure trail intersection we stopped at the last developed campsite, woodsy, but with a nice clearing, arriving there at about 5:40. This was our cross-country day. Leaving camp at 7:45 we crossed the river (easy rock and log hopping), and headed up. As we rose we decided we should have followed the outlet from Davis Lakes and so backtracked back down to that stream, and forded across to the northern side. We were able to stay along the bank all the way up to a small pond (well, I did ford and re-ford at one spot, but it turned out I did not have to, as an fairly easy scramble got my partners past that spot without fording). We then rose above tree line. 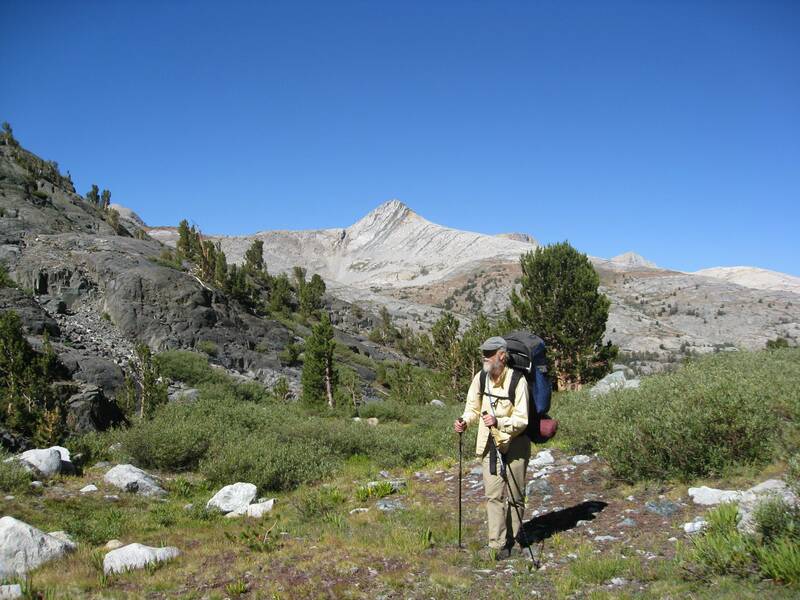 We came across a couple of other hikers fishing, which was a good thing, as they advised us not to continue following the outlet, which veered off to the right, but rather to continue straight over the ridge. This led us to the first couple of Davis Lakes. 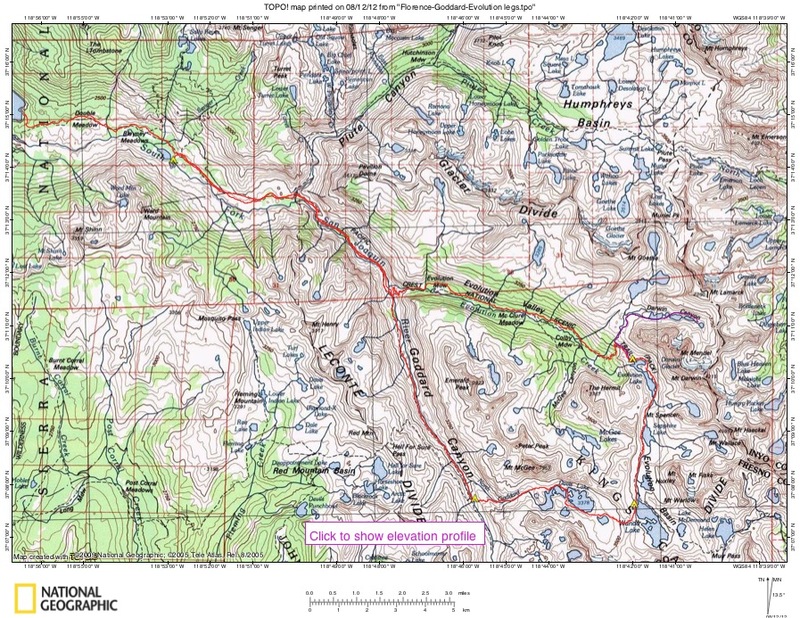 There we ran into another hiker, who, pulling out his topo map asked where he was on Wanda Lake and where was the John Muir Trail. 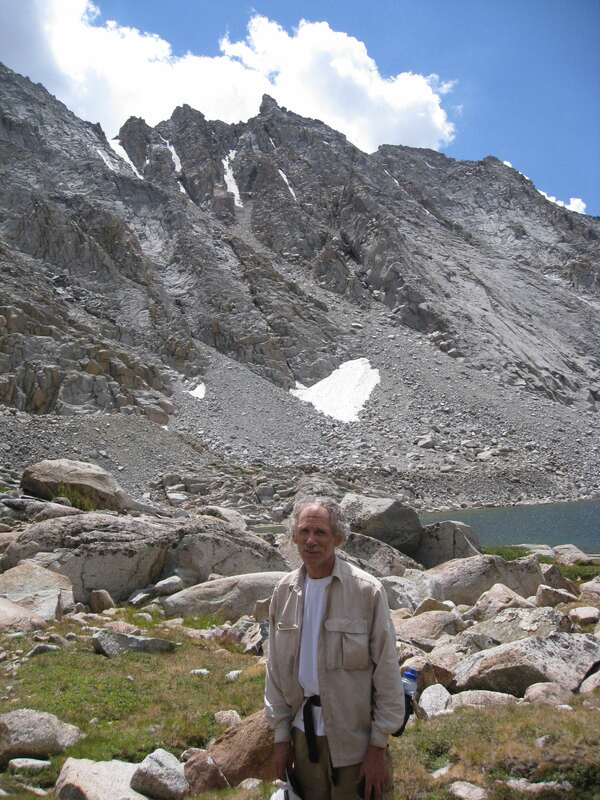 I let him know that the reason he could not find the JMT was that he was not at Wanda Lake. It turned out he had misread his map, and come over a different cul than he had thought and planned as he came over from Iona Basin. 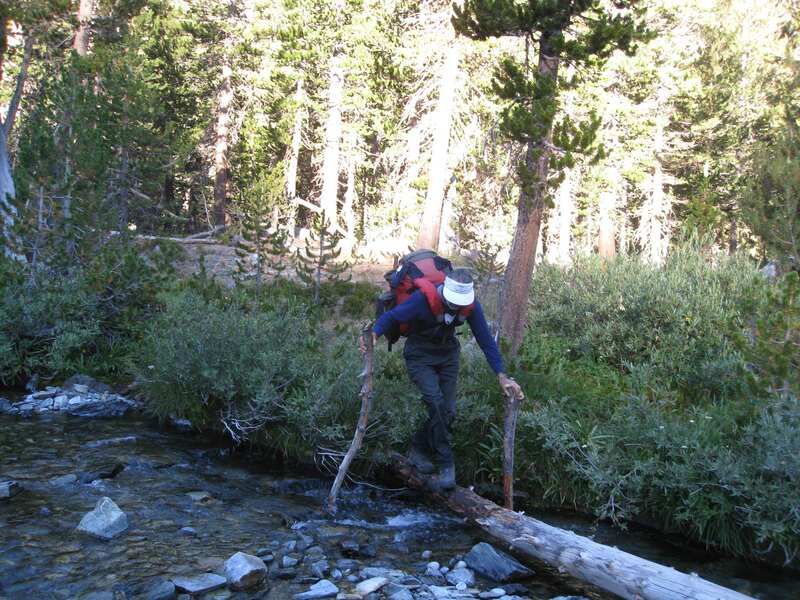 He then joined us as we found our way to Wanda Lake—and in fact his GPS came in handy in finding the most direct route to the pass. As we ascended the top we saw a helicopter fly fairly low over us. Heading down a bit later we saw what we thought was a yellow tent at the northern end of the lake, until it took off. It turned out to be the helicopter that had arrived due to a distress call. This turned out to be a false alarm—a guy thought he was having heart trouble, but due to an unevenly packed backpack he had cut off circulation to one arm, we found out later. We found a reasonable spot on the west side of the lake at about 4:30, near the outlet, but the best spots were already taken. That evening at about 6pm it started to rain, then it turned into hard rain and hail with thunder and lightning for a couple of hours. But it did clear up at about 8pm, and we all managed to stay reasonably dry. Wanda Lake is above tree line, with great views. And we could make out the Muir hut at the pass from where we were. 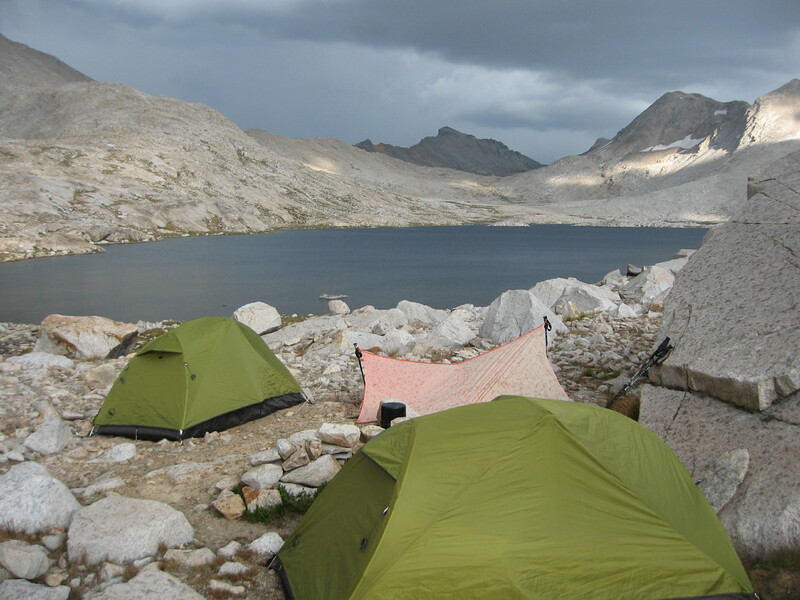 At 8:00 we headed down Evolution Basin just a few miles to the end of Evolution Lake and found a lovely open campsite on the lake. 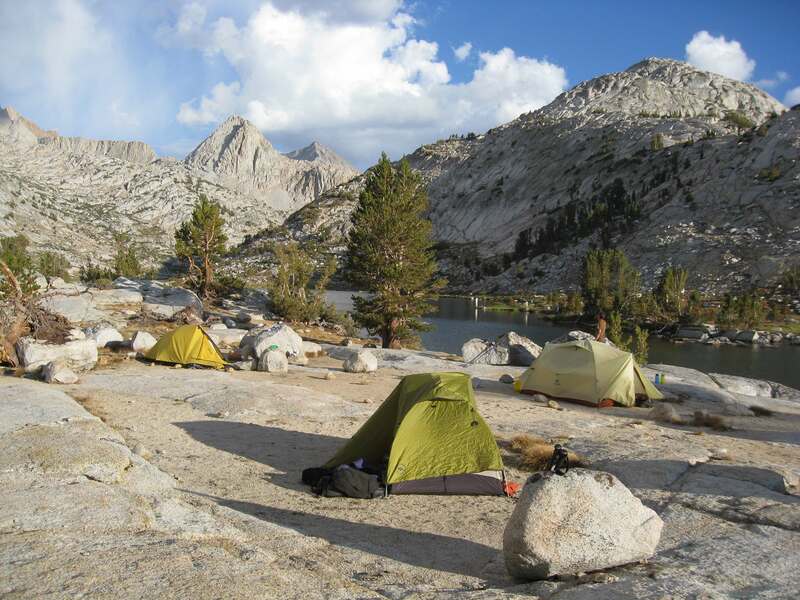 Evolution Lake has lots of excellent campsites. Some of the best are right at the outlet with a view both down into Evolution Valley, and back up the Basin, though those were taken when we arrived, even at that early hour (mostly people staying there for several days it seemed). There are also some less exposed sites on the on the east side of the lake (still at the outlet end) if you want more privacy, though they are further from the water. 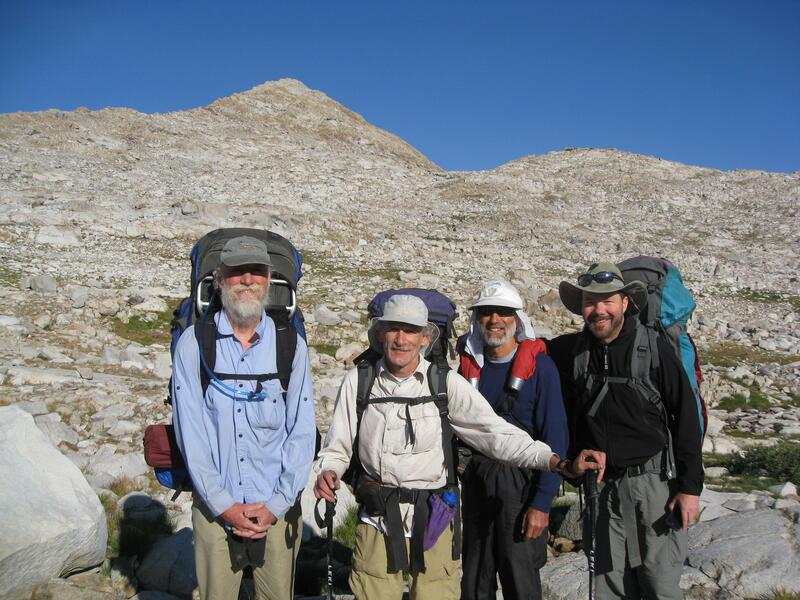 After setting up camp there, we decided to accompany our lost hiker friend up to Darwin Basin for a day hike—as he was on his way to head over Lamarck Cul. There is a use trail up but once up to the basin the trial comes and goes, and sometimes alternate trails can led one astray. 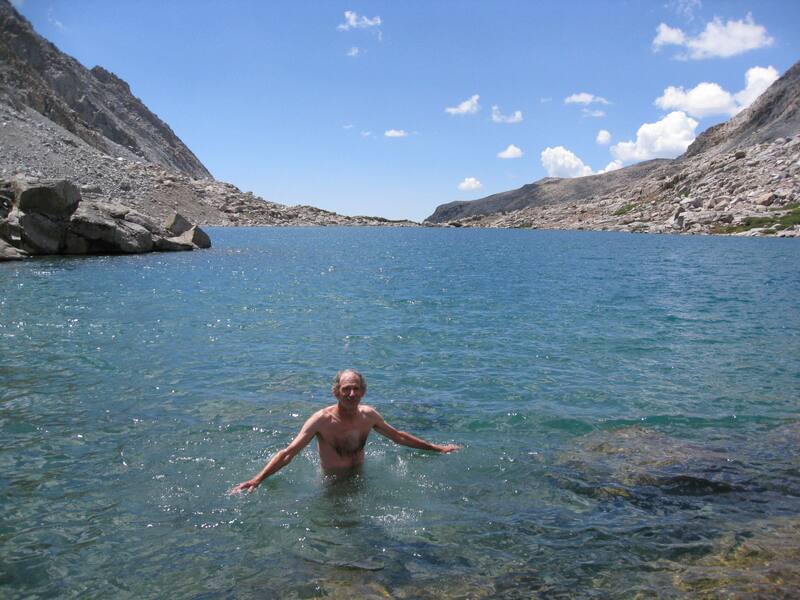 While Shahe went on to climb to the cul, Ted and I took a quick dip in the next to last lake, quite refreshing! On the way back down, Ted and I did lose the trail where it started to drop down, an had to scramble down to refind the trail. When we got back to camp we also swam in Evolution Lake, which was comparatively warm (though of course still quite cold). We got a relatively early start at 7:30 to head first steeply down into Evolution Valley, then gradually down the valley until another switch back dropped us down from there. We stopped for a first lunch and quick dip in a little pool off the trail at the end of the valley. Soon after we had to ford a stream, but it was not a difficult ford. 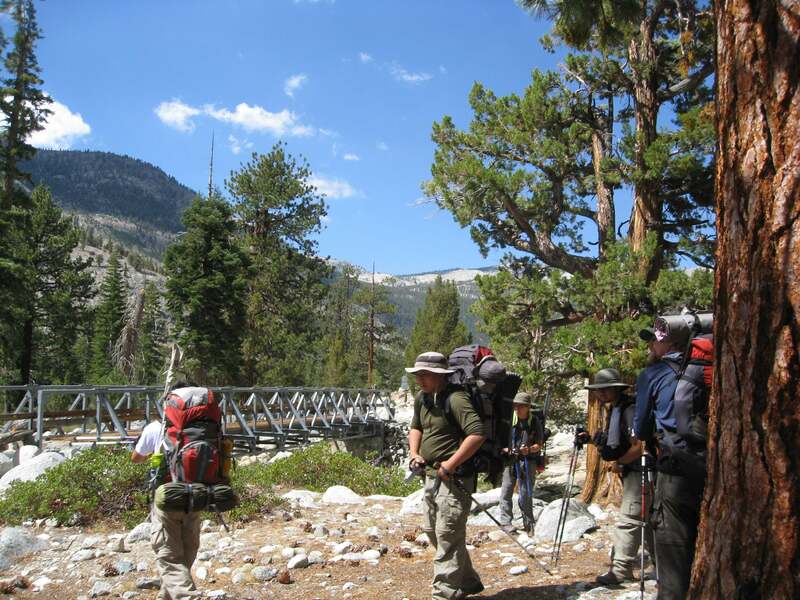 We stopped again at the Piute Pass junction at the bridge. We walked a little upstream and found a nice swimming hole there for a dip. It had gotten quite warm as we hiked and lost altitude, and while sometimes we got a breeze or shade, much of it was hot hiking in the sun. We finally arrived at Blayney again at about 4:30. We camped at our same spot as on the way in. We checked out the other side of the river for campsites, but all the decent spots on that side were taken. 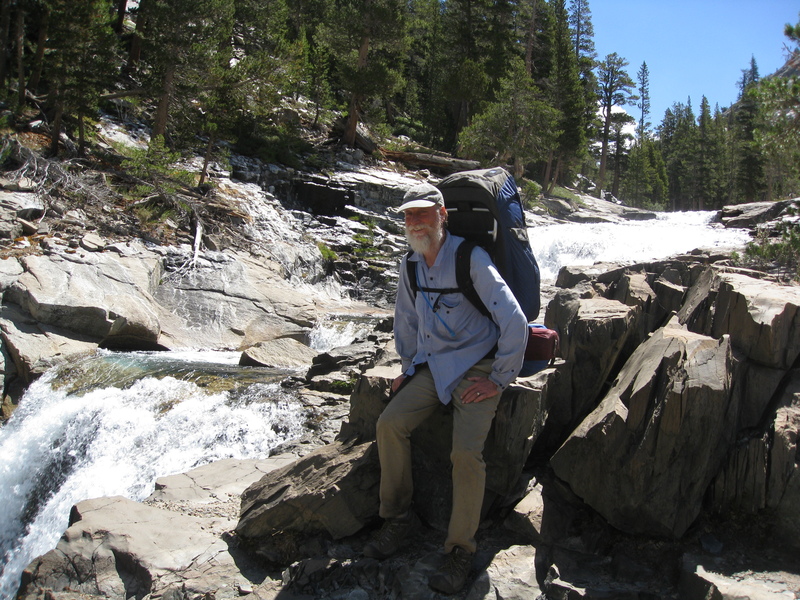 I was just as glad, as I did not really want to ford the river there and back with my pack. We took several opportunities to soak and swim, though there were a couple of rambunctious boys there and more people around in general than there had been on our way in. Getting another early start we trekked back to the lake. We got there at about 9:30 and had to wait until 11:00 for the ferry–though our one companion hiked around again–this time beating us back. (they leave that end every odd hour). As we crossed the river we watched a helicopter come to pick up water to douse some nearby small fires that we gathered had started form lightning strikes. It picked up the water and circled back about every 20 minutes. One thing that was a nice treat this trip was that there were virtually no mosquitoes! Maybe the only trip I’ve had where at least one or two days we were not inundated with them. 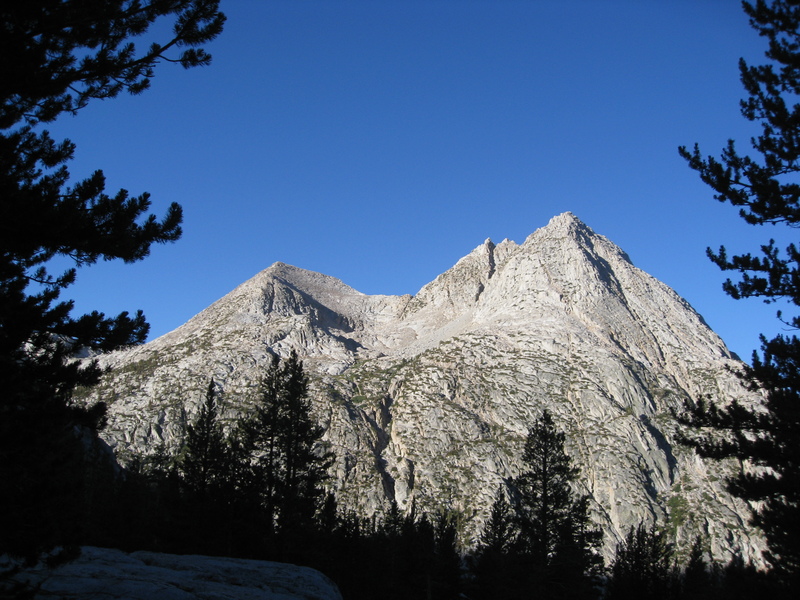 On the other hand, I’ve never seen so many people while being back-country—the JMT was practically a superhighway. You did an excellent job on your trip report. What an adventure both on and off trail! Your trip report helps others too. There is not much information out there on Goddard Canyon. 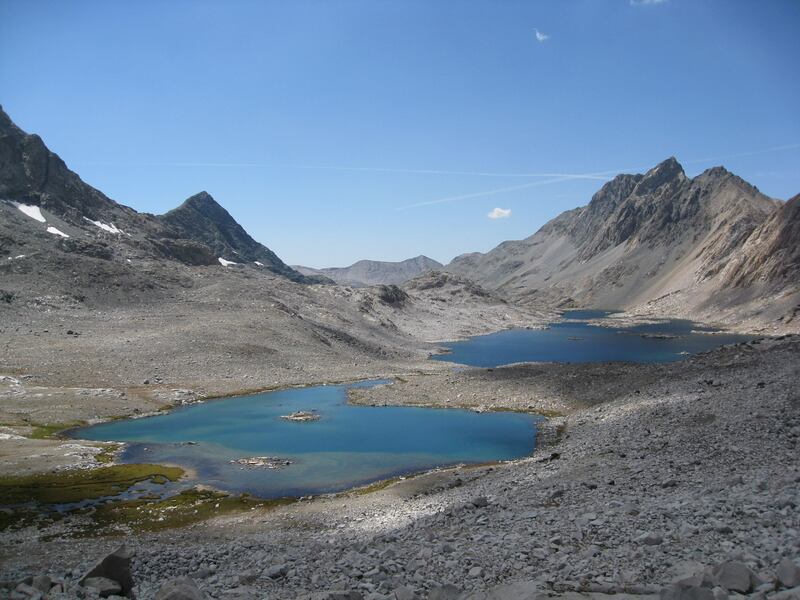 I plan on a trip to the headwaters of the south fork of the San Joaquin, Martha Lake this summer from Florence Lake.